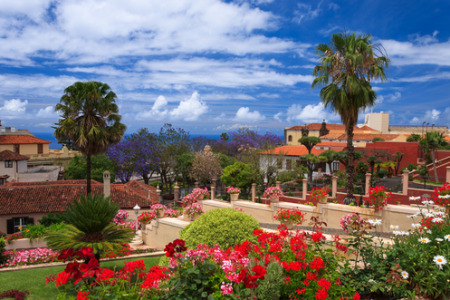 La Oratava holidays take you to a fertile area in northern Tenerife which stands like an oasis, framed as it is by barren hills leading to Mount Teide. Holidays to La Oratava can be enjoyed at any time of year as the summers are long and hot and the winters are mild. The busiest months are from April to October when temperatures reach a pleasant thirty degrees. Holidays in La Oratava appeal mainly to couples and those who enjoy hill-walking, rather than families who generally prefer to be closer to the beach. The historic town of La Oratava is a wonderfully peaceful place which displays its past affluence in its superb architecture. Its seventeenth century merchants houses reflect their former position in society. We have a number of cheap La Oratava holidays waiting to transport you to this charming area. With good accommodation and excellent restaurants catering for all tastes, they are considered great value, particularly since our commitment to quality and service is never compromised by price. Our low cost La Oratava holidays disappear like hot cakes, so it is best to book early in order to avoid disappointment. Nightlife is fairly low key but if lively evenings are wanted, a short taxi ride will have you in neighbouring Puerto de la Cruz in no time. For more information and to view our last minute La Oratava holiday deals, please use the search facility.